Focalware from Spiral Development calculates the position of the sun or moon at any time in any location around the world. This type of on-hand information is quite helpful to photographers in planning their shoots. Here Comes the Sun: Using Focalware, you can find out the position of the sun (or the moon) at any time in any part of the world—helpful information if you’re planning on shooting a photo. Let’s say you wanted to photograph the sunset in Venice or a building in London that was in the shade most of the day. You could use Focalware to determine the best time of day to shoot. When you open up Focalware, you’ll see an adjustable dial with three rings. The outer ring is a compass, an inner ring shows the position of the sun (or moon) and the center shows the azimuth degrees. You can drag the sun left or right to change its position in the sky. When you open Focalware, the app defaults to your current location using GPS or Wi-Fi, but you can manually enter any location you like by selecting one of the app’s preset cities or touching a point on the integrated Google map. Once you’ve got your location and date set, the app displays the sun’s elevation, azimuth, time of day it will occur, and the sunset and sunrise times. Focalware also displays a shadow ratio number you can use to calculate the length of shadows at that particular time of day. You can switch between sun and moon with the tap of a button and change the date by tapping arrows. Turning the device into landscape orientation will cause all of this data to be displayed as text. 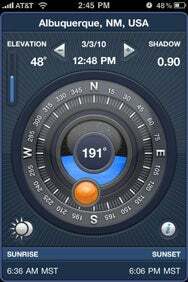 Focalware works with all iPhone models as well as the iPod touch and iPad but you’ll need at least a 3G to take advantage of the GPS feature and a 3GS to use the compass. For an app with one purpose, the asking price seems a bit high. But photographs or astronomy buffs may find the idea of having this detailed information handy to be more than worth it.